Tom Seay and Kristen Biscoe of “The Best of America by Horseback” will be on hand in early November as Bainbridge and the Paxton Theatre play host to special Christmas-themed programs honoring the military. A popular television program is coming to Bainbridge in November to film two Christmas-themed episodes as part of a series of events honoring the military and the beauty of the Paint Creek Valley. On Nov. 2-5, RFD-TV’s “The Best of America by Horseback” will conduct activities that will culminate in taping two Christmas shows at The Paxton Theatre on Nov. 4 and 5, honoring the military and veterans. Tim Koehl, owner of the theater, said the region’s strong military ties, with the Chillicothe VA Medical Center and both Rickenbacker and Wright-Patterson military bases nearby, was a strong draw for the production. Koehl said the event will help promote the entire region. On Thursday, Nov. 2, “The Best of America by Horseback” will host a ride at Tanglewood Acres, an equine campground with a trail head to the Pike State Forest and access to more than 50 miles of trails, according to a press release. The ride will be followed by a barbeque dinner that evening. Tom Seay and Kristen Biscoe of “Best of America by Horseback” will be on hand. On Saturday and Sunday, Nov. 4 and 5, two shows will be filmed, one at 7 p.m. Saturday, the other at 2 p.m. Sunday. 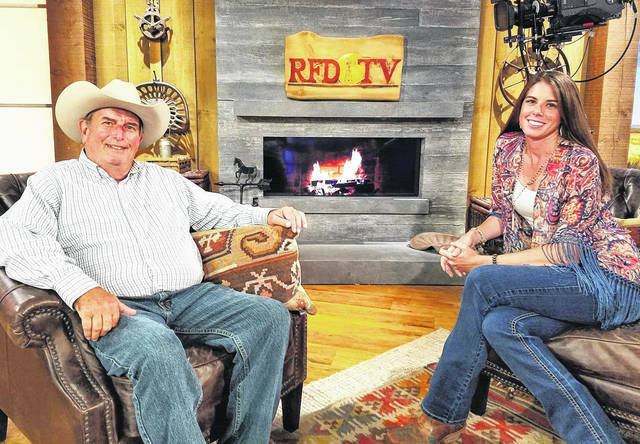 The shows will be aired as a Christmas special on RFD-TV in December. “We did a similar show years ago, the emotions and feedback we received was amazing, so we have decided that it’s time to host another one,” said Biscoe. A 2 p.m. Saturday parade honoring the military will be held in Bainbridge. Koehl said Larry “the Flagman” Eckhardt of Illinois is bringing about 1,000 flags to line the parade route and decorate the town. The 7 p.m. Saturday evening show at the Paxton will focus on the military, featuring Christmas, cowboy and western music from Del Shields and other guests. Also included will be special segments honoring active military personnel, veterans and their families. Sunday’s 2 p.m. matinee performance will focus on families, the community and the Bainbridge area’s valley home, featuring national and local entertainers and the winner of the fall church choir competition, along with more patriotic themes including military tributes. Tickets for the shows are $20 and are available online at PaxtonTheatre.org. The village of Bainbridge “will be alive with the Christmas spirit over the weekend, featuring carriage rides, community events, Christmas décor and historic home tours,” according to the press release. Koehl said the village, the senior center and Bainbridge Connection community group “have stepped up big time supporting the activities.” He said Mayor Vernonica “Rocky” Countryman is securing a large tent to shelter tables, chairs, sponsor tables, food, merchandise, vendors and light entertainment. Kevin Barreras, vice president of the Highland County Veterans Services Office, is coordinating with the contingent counties’ veterans organizations, said Koehl. The Chillicothe VA is supporting and promoting the show and activities. Galen Neal of the Hitch and Harness Group is coordinating horses and buggy rides Saturday and Sunday. The Highland and Ross County visitors bureaus and chambers of commerce are supporting the effort, said Koehl. More details will be announced as the event draws closer, said Koehl. https://www.portsmouth-dailytimes.com/wp-content/uploads/sites/28/2017/10/web1_horseback-show.jpgTom Seay and Kristen Biscoe of “The Best of America by Horseback” will be on hand in early November as Bainbridge and the Paxton Theatre play host to special Christmas-themed programs honoring the military.